DONGGUAN, Guangdong, China, January 6, 2014 (ENS) – To protect elephants from ivory poachers by destroying the black market value of their tusks, the Chinese government today conducted the country’s the first public ivory crush. In the southern city of Dongguan, 6.15 metric tonnes of raw tusks and carved ivory pieces were dumped into crushers and ground to rubble. “The event, the first public ivory destruction in China, was to demonstrate the country’s determination to discourage illegal ivory trade, protect wildlife and raise public awareness,” said Zhang Jianlong, deputy head of the State Forestry Administration. It is a significant step in wildlife protection and will contribute to the global fight against elephant ivory smuggling, Zhang said. 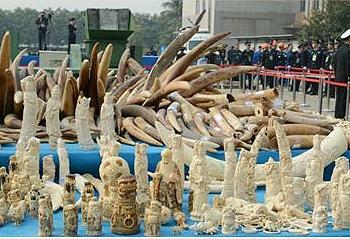 The destruction of the ivory, held by the SFA and the General Administration of Customs, was attended by representatives of foreign countries and international organizations, such as the United Nations Environment Programme China Office, the International Union for the Conservation of Nature China Office, WWF and its wildlife trafficking monitoring branch, TRAFFIC. John Scanlon, secretary-general of the Convention on International Trade in Endangered Species, CITES, told the assembly that the crush shows China is determined to end this illegal trade. “If you do trade illegally in elephant ivory, you now run a much higher risk of being arrested, prosecuted and severely punished, and the return on your investment in illegally traded ivory may end up being jail time, heavy fines and seized assets,” Scanlon told the officials who gathered to witness the crush. Chinese laws stipulate that anyone involved in illegal trade in elephant ivory is liable to punishments ranging from six months imprisonment to a life sentence. 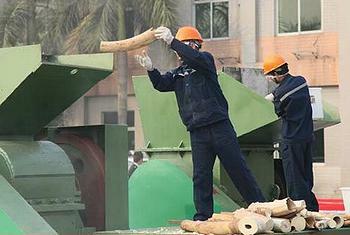 “Through today’s public destruction of 6.2 tonnes of seized ivory, China, as a main destination country for illegal elephant ivory, is sending an unequivocal message – both domestically and internationally – that it will not tolerate this illegal trade,” Scanlon said, estimating the weight of the crushed ivory a little higher than the Chinese government. The ivory crush takes place a few weeks after eight Chinese citizens were convicted and sentenced to three to 15 years imprisonment in Anhui Province for smuggling 3.2 tonnes of ivory. Even so, elephant killing and ivory smuggling are still a major problem, warned Scanlon. The latest figures from the CITES program Monitoring the Illegal Killing of Elephants, or MIKE, show an estimated 22,000 elephants were illegally killed in 2012, an estimated 96 elephants poached each day. He said the situation is at its worst in Central Africa, where estimated poaching rates are twice the continental average. “The destruction of seized ivory makes an important public statement that, in conjunction with other government-led efforts to reduce demand, has the potential to have a significant impact on the illegal market for ivory,” said Tom Milliken, ivory trade expert with TRAFFIC. As the major destination for ivory in Asia, “China’s actions, more than those of any other country, have the potential to reverse the rising trends of elephant poaching and illegal ivory trafficking,” said Milliken. 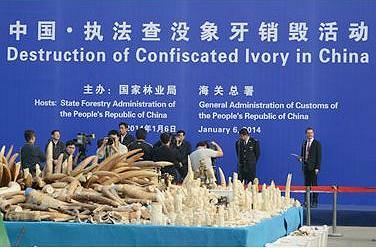 The ivory destruction ceremony took place following an illegal wildlife trade conference organized by the State Forestry Administration, where recognition rewards were issued for outstanding actions in combating illegal wildlife trade, including the Beijing Forestry Police Department and Guangzhou Customs. On November 14, the U.S. government destroyed six tons of illegal ivory, sending a message that the United States will not tolerate wildlife crime that threatens to wipe out the African elephant. U.S. officials from the Department of the Interior and they U.S. Fish and Wildlife Service participated in today’s event. Gabon and the Philippines have also recently destroyed ivory stockpiles, while France has signaled its intention to do so.